The PEN/E.O. Wilson Literary Science Writing Award celebrates writing that exemplifies literary excellence on the subject of physical and biological sciences. The winner receives a cash award of $10,000 and will be honored at the PEN Literary Awards. 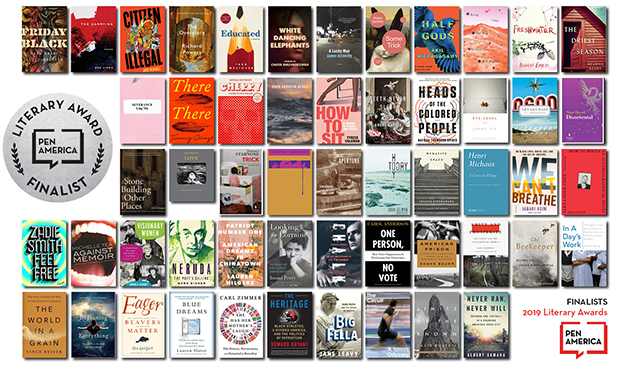 The winner will be celebrated at the 2019 PEN America Literary Awards Ceremony on February 26 at the NYU Skirball Center in NYC. This year’s PEN/E.O. Wilson Literary Science Writing Award judges are Arianne Shahvisi, Jeff VanderMeer and Christie Wilcox. Arianne Shahvisi is a Kurdish-British academic philosopher based at the Brighton and Sussex Medical School. She completed her PhD at the University of Cambridge on the philosophy of cosmology. Her current research focuses on race, gender, and migration. Shahvisi edits the science section of literary magazine The Offing, which seeks out and supports work by those marginalized in literary spaces, and serves as an editorial board member for Kohl: A Journal for Body and Gender Research. She has written commentary for the New Statesman, Jacobin, and The Conversation. Jeff VanderMeer has been called “the weird Thoreau” by The New Yorker for his engagement with ecological issues in novels such as the Arthur C. Clarke Award-finalist Borne and the NYT best-selling Southern Reach trilogy (Annihilation, Authority, and Acceptance). VanderMeer’s fiction has won the Shirley Jackson Award and the Nebula Award, among others, and been translated into 35 languages. His nonfiction has appeared in the New York Times, the Los Angeles Times, and The Washington Post. He lives in Tallahassee, Florida. Christie Wilcox, Ph.D. is an award-winning science writer and the author of Venomous: How Earth’s Deadliest Creatures Mastered Biochemistry, named one of Smithsonian Magazine’s Best Books about Science 2016 and Amazon’s Best Books of 2016. Her bylines include The Washington Post, National Geographic, Popular Science, and Discover. She currently lives on Washington’s Olympic Peninsula, and edits for the YouTube channel SciShow. “Tara Westover Among PEN Award Nominees.” The New York Times. January 24,2019. Lindsey Fitzharris, Luke Dittrich, Lauren Redniss, Joshua Horwitz, Dr. Carl Hart, Leonard Mlodinow, James Gleick, and Siddhartha Mukherjee.